piscina(4x8) con impianto di acqua salata, gazebo attrezzato con lettini e angolo lavabo e frigo . solarium con gazebo, tennis tavolo, biliardino; terrazza superiore attrezzata con angolo cottura, barbecue, home teatre con ampia scelta di dvdblu rey, impianto audio esterno,giochi. Parcheggio privato interno, pozzo privato. une belle villa, confortable, très bien équipée, avec une vue superbe sur la Mediterrannée, et les montagnes environnantes, à moins de 20min d'une des plus plages de la côte (Bazzano) et d'un des plus beaux village d'Italie (Sperlonga). Vraiment idéale pour les familles nombreuses ou entre amis ! mange rum og etager, hvor de kunne lege gemmeleg. fantastisk, var en fryd for øjet, og der var så meget mad, at vi spiste lækre desserter i flere dage efter. havde brug for ensomhed og ro i løbet af dagen, men samtidig gerne ville slikke sol. Værelserne inden i huset var fine. De 2 mindste værelser på 1. sal var dog svære at få kølige til natten. ovn, og lidt mere plads i køkkenet, men vi klarede os. kloaklugt, som bredte sig til hele rummet. tæt på indkøb og byliv. Vi kan varmt anbefale Luna Rossa, og det er ikke sidste gang vi holder ferie i Luna Rossa! Our stay at Villa Luna Rossa was perfect. 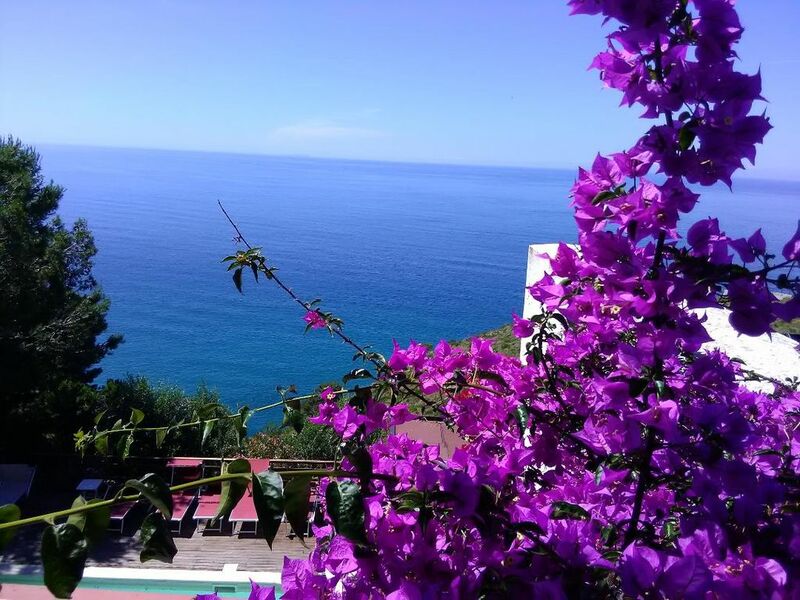 High in the hills between Gaeta and Sperlonga, the location was ideal and the ocean view endless.We were a group of 6 adults celebrating my husband's 40th birthday, and staying at Luna Rossa was the best decision we made. Guilia and her family were excellent hosts, including a welcome meal we asked her daughter to cater. Fabulous! We loved our stay in this villa with the most spectacular views. From the minute we arrived we felt the stress and tension from our long flight and car ride melt away. The resort is in fact for lovers of nature, but more evident was the graciousness of our host. Even though we don't speak more than a few words of Italian, Giulia made us feel at ease and was extremely helpful despite the language barrier. We just adored her and her family. Especially wonderful was the meal we contracted her to provide and the appetizers that were awaiting us upon arrival at La Luna Rosa. Her daughter Chiara is a great chef! What a fabulous way to begin our stay and settle in from the jet lag. We would totally recommend this villa for travelers looking to get away from the crowds. This area around the villa is a gem and a wonderful alternative to Rome in the hot summer months. Sperlonga and Gaeta, the towns closest to the villa are easy to get to, and both very beautiful. There's a lot of history to explore, as well as great beaches, farmers markets, and excellent restaurants. If you are at all on the fence about renting this villa, don’t be. You will feel like you are on top of the world! We are already talking about going back for another stay, next year. Thank you Giulia. You are wonderful. ITRI, 170 m asl, perched on the slopes of the Aurunci Mountains, extends to the rocky coastline of Punta Cetarola between Sperlonga and Gaeta. The town consists of two parts : the older settlement, with clusters of houses around the beautiful castle, is located on the Colle Sant'Angelo, while the more modern part extends along the Via Appia , with several stretches of the ancient road still visible today. Worth visiting are the Churches of San Michele Arcangelo, dell'Annunziata, and the Convent of San Francesco. Two kilometers of well- preserved ancient Roman road wind through the Gorges of Sant'Andrea between mighty square and polygonal constructions and more recent works like the Fort of Fra Diavolo, Victor Hugo's 'bandit-patriot' immortalised on the silver screen by Laurel and Hardy, and on the French stage with Fra Diavolo, ou L'Hotellerie de Terracine. The Museo del Brigantaggio tells the story of brigandage in the lower Lazio region. Itri has been used as a set for many film productions. Nearby: Formia,Gaeta, Campodimele, Esperia, Fondi, Sperlonga. santuario della Madonna della Civita, on Mount Fusco, which is a place ofpilgrimage, Southern Via Francigena. GAETA, 2 m asl,a former maritime republic and a popular holiday resort as ealy as ancient Roman days, is situated on the spur of Mnte Orlando and is a seaside town with a temperate climate and an abundance of historical and religious monuments. Its coastline is a succession of beautiful beaches bordered by rocky cliffs, and along the coast you can find towers, bays and coves. The oldest part of the town winds around the majestic. Angevin-Aragonese Castle and there are many important religious buildings including the Sant'Erasmo cathedral, the cosmatesque bell tower dating back to the 2 half of the 12 century, and the Santissima Annunziata Church which has a golden chapel entirely decorated in wood and gold. PONZA , 0 - 280 m asl, is a popular tourist destination renowned for the beauty of the sea and for its history- first Roman and then Bourbon - and for being well connected to the mainland. Ponza boasts an incredible variety of underwater faunaa and flora and is the largest island in the Pontine Archipelago. The urban centre dates back to the 18 century Bourbon colonization, while traces of the ancient Roman settlement are scattered all over the island, from the ancient port to the remains of houses and cemeteries. The landscape is mostly hilly and is dotter with beaches, some accessible only from the sea, including the beautiful Chiaia di Luna, Frontone, Lucia Rosa and Felci beaches. Agrippina Minor and her sister Livilla were exiled on the island after they conspired against the Roman emperor Caligula. to discover in the surrounding area: The other Pontine island: Ventotene, Palmarola, Gavi, Zannone. Campodimele is called 'the town of longevity ' thanks to its quality of life, wich is the subject of population studies aimed at discovering the secret of the elixir of life. It is also home to the Monti Aurunci Regional Park: more than 45.000 hectares that extend almost to the sea, towards the Gulf of Gaeta. the history of SAN FELICE CIRCEO is rooted in the myth of Ulysses who, according to the Odyssey, landed here, was seduced by Circe and stayed a long time. The area has been inhabited since very ancient times, as can be evinced by the numerous remains of Neanderthal man found in the Capre, Guattari, Fossellone and Breuil caves. in summer the picturesque old town comes alive at night around the 13 century Torre dei Templari and the Palazzo Baronale, both of which are on the little Lanzuisi square. From here you can discover the Circeo hill either by taking the Crocetta road which cuts though an oak forest to a plateau that leads to the ruins of the Acropolis Circeii, or by taking the Faro road that winds up the southern coastal slope.